The Litter Box: I Don't Need Your Sympathy Or Apathy. Your Empathy Is All I Need. Is That Too Much To Ask? I Don't Need Your Sympathy Or Apathy. Your Empathy Is All I Need. Is That Too Much To Ask? Sympathy - I am not asking for that. 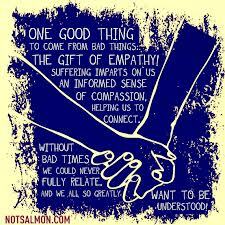 Empathy is what I need. Apathy is what I despise the most. Seeing these words here now, I wonder if people know what they all mean. Sympathy is when you pity someone while empathy means you feel for someone and you understand and lastly, apathy is when you are numb and don't care at all. I have done all three things. I have shared my sympathy for many people but they say that I should not pity them instead empathize with them. I did not understand it then but I do now. There was a time in my life when I became apathetic. I do not remember how long that was but it happened. That was a chaotic time in my life. It was a stage that I do not want to go back to. Do I want to feel numb again to stop feeling all the pain that I have right now? Sometimes I am tempted to but I know that would not be normal. Suppressing it all and forgetting them all will not help me. It will just pile up inside of me until I burst when I cannot take it anymore. I don't want that. When my daughter, Lilly, died, I felt like it was the end of the world for me and husband. We were so lost, so crushed. We felt like we cannot live anymore. We cried buckets of tears until we were all dried up but the pain remained. The pain continues to burn deep inside our hearts everyday. We mourn for her each passing day. We pretend that she is just far away and that we cannot be with her but one day we will. She is in heaven now. That we know. We just cannot bring ourselves to accept that always. Until when will we continue to grieve? I don't know when. My husband has already promised our baby that he will not cry as he needs to be strong for me. In my case, I cannot bring myself to promise that as I still cry sometimes for long moments especially when I miss her and whenever I feel regret or guilty for her loss. Ever since she passed away, many people have sent their deepest condolences. Most of them were my friends. Some my previous office mates and even my boss. Others my acquaintances. But most of all, my family and relatives. Nobody knows the pain that I am feeling and I am sure no one will ever understand exactly how it feels to be in my shoes but then again, the thought that they went out of their way just to comfort me was something that I was thankful for. I am not seeking attention. All I am seeking is comfort. Comfort in the fact that there are people out there who care. Comfort in the fact that even in my darkest hour, there are some people who will never abandon me. As I have said, I don't need sympathy. All I need is empathy. Empathy that I rarely get from people. Empathy that I rarely ask from everyone. It is sad though that most of the time, all I get is sympathy or what's worse, apathy. I know I am not the center of the world and so whatever happens to me shouldn't concern everyone. All I am saying is that the people that you expect to at least give a damn end up having none. Even friends and relatives who you thought would at least extend their condolences or ask how you are end up ignoring you or end up not acknowledging the fact that you lost a child. I hate it when people do that. Okay, fine. Don't care at all but don't expect me to care when you need me. That's bad, I know. I just can't help it sometimes. I don't expect much from these people. I just thought maybe they would have the decency to at least show they care. Not just for me but to those who have lost Lilly. Which makes me wonder if they care for Lilly at all. Oh, right. They never met her. They never saw her expect through the pictures that I posted. They never even visited me while I was at the hospital recuperating after giving birth. They could have at least said hi. During Lilly's wake, they never even dropped by to see my child. They never even held my hand, hugged me or told me even through a text message, a call or a facebook message that they care and that if I need them, they are there. None of those. I hate it when people abandon you when you are not at your strongest. I am not a weak person. I am a fighter and I am usually the one people depend on. Now, I am weak. I need my husband and those around me to empathize with me to feel strong again. I need people right now to care for me because I am still fragile. I still hurt. I am still in pain. But I guess caring is too much to ask for other people. So now I have to learn to get used to being sympathized and also being totally ignored. It is the teenage years all over again. Awkward moments. Bullying. Being ignored and uncared for by others. I hated that. Those years were not worth reminiscing. Maybe some parts of it were but not all. Never. It has been nearly a month since Lilly's passing and yet many people continue to support me. I am glad that they are there for me despite the distance and everything else. I guess I should stop thinking negatively about the others who never cared and who just pity on me. I know I am loved and cared for and that Lilly was too. She will forever be precious to all of us. Never forgotten, Always missed. To those who have shared their never faltering empathy, thank you. To those who have shared their sympathy, thank you as well but I don't need it. Lastly, to those whose apathy they have displayed, screw you! I am no longer giving a damn about it. Life goes on and I should move on. I know this. But not now, just not yet. When I am ready, I will be thankful. Thankful because there are people out there who helped me. If you are one of them, thank you so much. Sadly, looks like many people's empathy gland is depleted these days...We are now in an age filled with either sympathy or apathy. What a sad way to live. What is this world turning into?